Thirupullani temple is one among the 108 divyadesams, located 8 kms. from Ramanathapuram. This temple dates back before Rama avatar. It is said that the childless King Dasaratha worshipped "Adhi Jagannathar" in this temple and offered HIM paal payasam (milk kheer) and was blessed with four sons. So, Tiruppullani temple is famed for paal payasam. Childless couple come here and pray to get children. It is believed that childless couple will be blessed with a child, if they take a holy dip in 'Sethu', worship the deity 'Santanagopalan' and offer ‘paalpayasam’ (milk kheer) to Him and partake the payasam prasadam. This temple is closely associated with 'Ramayanam'. This is the place where Rama built the bridge to cross the ocean and reach Lanka. Sri Vaishnavas perform 'Sethu snanam' at nearby 'Sethukkarai' seashore, which relieves one from the sins. Lord Rama camped in Tiruppullani before crossing the ocean. Sri Rama reclines in 'Dharba grass' in this temple and is called 'Dharbasayana ramar'. The place is called 'Saranagathi Kshetram' because of the surrenders made by Samudraraja, Vibhishana and Mahodadi. And coming to palpayasam, the taste of 'Pal Payasam' at this Kshetram is unmatched. 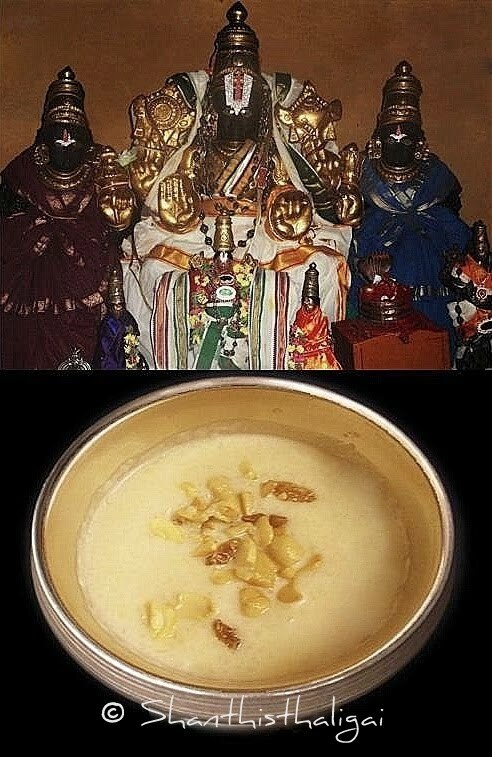 When I enquired about the preparation of this payasam to my friend Sri.Raghuveeradayal swami from Tiruppullani, he immediately contacted the madapalli and Sri.Sudarsan babu who makes this kheer in the temple's kitchen gave me the recipe which is with very little ingredients and the bulk measurements. I have given the measurements in small quantity. Do make this at home and offer to 'Sri Rama' on 'Rama Navami' and Sri Krishna on 'Krishna Jayanthi'. 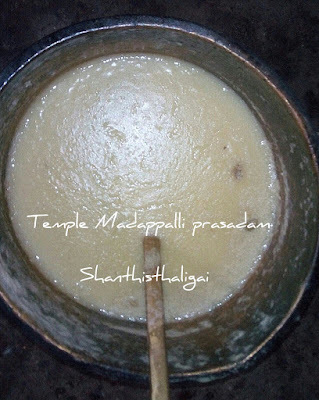 The 'Palpayasam prasadam' is available daily at the temple from morning 10 A.M. upto noon. Do schedule a visit to the temple and this place which stands as a witness to history. Jaggery powder (naattu sarkarai in Tamil, brown sugar) - 1/2 kg. Cashews and dry grapes (optional) - It is said that Kind Dasaratha did not add any of these as he was in sorrow being childless. While on Yathra, he worshipped and prayed Jagannathar and offered palpayasam with the available ingredients at that time. Heat a heavy bottomed pan, pour in 3 cups of water. When water boils wash and add the rice and cook until very very mushy. Now add milk and allow it to boil until thick, stirring frequently. Finally add brown sugar/ jaggery powder, powdered cardamom and mix well, cook until the raw smell goes. Switch off the stove. Add ghee fried cashews and dry grapes if you feel so. Thirupullani palpayasam is ready, Offer it to "Perumal". Looks divine shanthiji !! Thanks for sharing! ! Whom to contact for making the payasam offer to perumal.